The need to battle alcoholism has existed for as long as there have been men walking the earth, and for this purpose, a form of torture in a barrel was invented. Barrels can be one of two types – opened or closed-bottomed. A prisoner in a barrel without a bottom had to constantly walk around with a burden and the punishment forced him into a humiliating position. 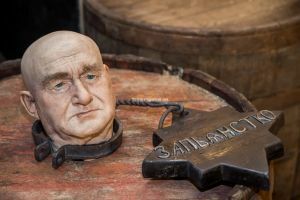 Torture in a barrel with a closed bottom was even more brutal, because the drunkard had to sit in his full excrement and other putrid liquids for the entire day. To sober him up or teach him a lesson, the barrel was periodically filled with ice cold water and the man left to sit inside. 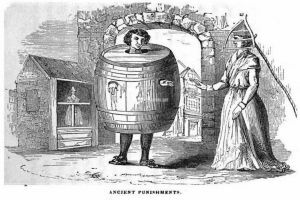 The punishment was always carried out in public in order to ridicule the trouble maker and show the viciousness of alcohol. Drunkards who was undoubtedly unrestrained were awarded additional weights in the form of medals entitled the “Order of Drunkenness”. Some of these weights were as much as 7 kilograms, and they were hung around the neck. 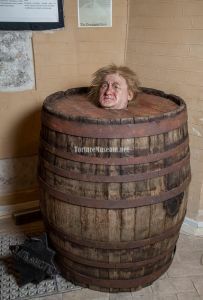 After such a trial, a person picked from the barrel would have a great sense of shame, adding to the aches and pains all over his body. An interesting fact: In ancient Rome, criminals were punished in a barrel filled with excrement. Executioners waved their ax over the head of the barrel every time the prisoner came up for air. If they could last the entire day like this, they would be pardoned. There are punishments whose sights are reminiscent of fun, or even a themed attraction. Most often they are arranged for the betterment of the people, and as a reminder to citizens of behavioral norms and a healthy lifestyle. 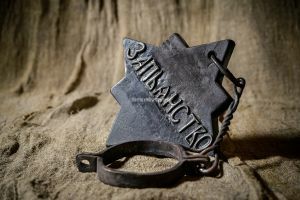 The subject of one such torture, however, does not have it so sweet. Look at this venerable Sir! Oh good, he’s already well-known within the entire district! Pub owners break out in a cold sweat when he orders his “starting drink”. This type of ‘start’ might end in an actual pogrom because this man — he is prone to aggressive fervor when in a drunken state. 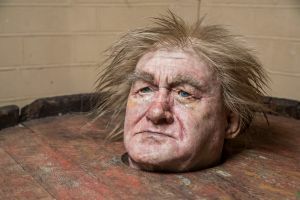 Prior to this particular case, he got away with a tap on the wrist, but today the drunkard is going in the barrel for the night. He is sobered up for a few hours with water. Upon hearing laughter, the man comes around to noticing that his barrel sits in the middle of a lively square. Moaning to the guard standing nearby, he complains of a hangover. The guard smiles and douses him with a full bucket of crushed ice. The alcoholic squeals like a baby pig, and breaks into a swearing tirade. In response to this, the guard threatens him with a bayonet, and places a cast iron star around his neck which states: “The Order of Drunkenness”. Additional stress is being added to the pain of the drunkard’s headache — the “Order” medal weighs 17 pounds. Evening has come. The guard throws in two more buckets of ice. The skin of the lawbreaker is wrinkled from his long stay in the water, lips turned to blue, neck stiff. Boys running past throw rotten vegetables in his face. The man takes a sip of the dirty barrel water. Now he only dreams of one thing — getting free and drinking a glass of vodka.